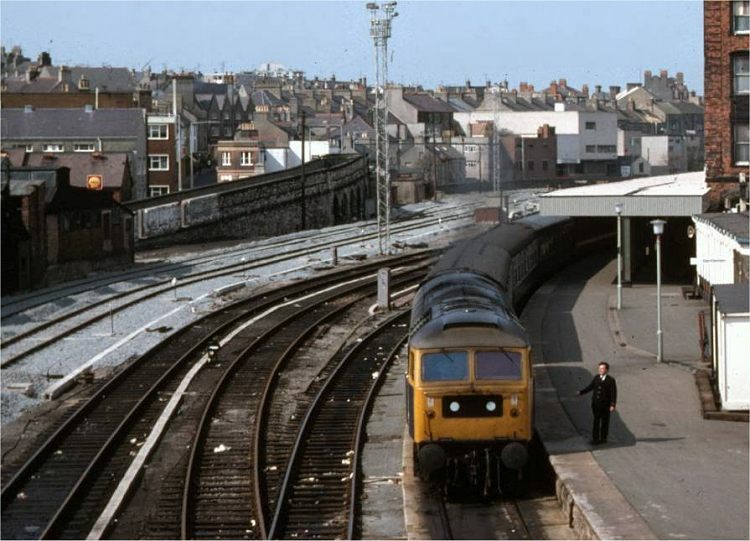 Holyhead on Saturday 22nd April 1978. 47100 pulls forward in Platform 1 with the stock of 1J53, the 1700 SO to Manchester Victoria. I've picked this shot as it shows that work was almost complete on the refurbishment of the carriage sidings alongside the station. Now, 25 years later these sidings are to be removed, and yet another road built through Holyhead. Prominent in the background is the remains of the cattle road that once allowed cattle to be driven between the cattle pens (opposite the engine shed) and the dockside. Holyhead station spent many years being redeveloped in somewhat piecemeal fashion. Although a new canopy had been provided for platform 1, the station hotel building was still in existence. When this was knocked down, the station remained like a building site, whilst a decision on what to do next was awaited. Eventually a new building and footbridge to the town were provided, but the removal of the ferries to Ireland from the inner harbour has changed the focus of the station, and the main entrance is now at the furthermost point from the town.